And if any of this is starting to sound familiar, then you really do need to read the rest of this webpage very carefully. You're being duped into believing that operating a successful Internet business depends on you having some "magical formula" or some bundle of arcane "secrets" that only this week's hot marketing guru seems to know. And oh yes - those are the very same "secrets" he will be so happy to reveal .... if you'll just fork over next week's grocery money! There are No Online Profit Secrets .... There are only Online Profit Systems. Step 1 - define a market and find a product to sell. Step 2 - put a good salesletter on a website. Step 3 - advertise the product and the website URL. Step 4 - and FOLLOW UP with each prospect until they are ready to buy! Now all those steps are important if you're planning to make website sales. In fact, without any one of them, the online profit system doesn't work at all. But which step do you think is most critical to making long term consistent profits? If you said Step 4 .... then you win the prize! And why is Step 4 the most important? Because no matter what you're selling, very few prospects will buy on their first visit to any website - even if they have a defined interest, desire, or need for the product. Maybe they want to "think about it" for awhile. Maybe they need to wait until payday. Maybe they aren't [yet] sure of your business credibility. But here's another cold hard fact .... are you ready for it? Business Owners Drop The Ball .... Bigtime! And WHY do they drop the ball? Most of the time, it's simply because they don't know HOW to entice website visitors to subscribe to an opt-in email follow up list. They don't know HOW to set up and run an effective follow up marketing campaign. They don't know HOW to maintain subscriber interest and keep those prospects "on the hook" until they are ready to make a buying decision. And as a result, 80% or more of all live prospects end up falling right through the cracks, never to be seen or heard from again. As a result, 80% or more of all potential sales are left on the table for competitors to claim. .... when in truth, it's been slipping right through his fingers. Well my friend .... the buck stops here! How To START Making More Money From The Traffic You're Already Getting And STOP Leaving 80% Of Your Sales On The Table For Your Competitors To Claim! This guide was written for "the little guy!" 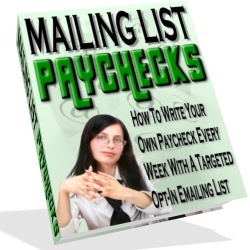 a precise plain English 14-step "recipe" to creating a fully automated follow up email marketing system that does most of the work for you and maximizes sales from whatever amount of website traffic you're already getting. in-depth professional online training videos to help you kick off this powerful list building money-making system. precise instructions on how to quickly write a 7-message follow up email series to promote any product or service (affiliate based or your own!) even if you think you can't write worth a lick. priceless insight on the kind of messages you need to send, what they should say, why they should say that, and at what stages of the follow up sequence you should send them for the best effect. a re-visit to a decades old but proven two-step promotion plan that will drive any lead capture system for pennies, and that works on the Internet better than it ever did before - PLUS the six rules you must follow to do it right the first time. a non-technical breakdown on autoresponders (the workhorse of any automated follow up system) - what they really are - and how to find the best one to suit your own needs. In other words, the minute you open "Confessions of a Follow Up Marketing Geek" you'll realize right away that it is not another volume of vague and loosely written theory. There are no discussions of high-flown techniques that don't apply to small business. fully automate your entire email marketing program. entice your website visitors to voluntarily opt-in to your mailing list. maximize your results from any sign-up page or lead gathering system. leave your competitors (even other affiliate sellers!) behind in the dust. plug the prospect/profit leaks in your marketing system once and for all. capture more of that 80% of all prospects who were (until now) just slipping through the cracks at your website. automatically create trust and credibility with new prospects. build relationships that turn one-time buyers into lifetime customers. automatically promote new products to those proven buyers for a phenomenal clicks-to-sales conversion. reduce unsubscribers and refunds on sales to a bare minimum. sign-up a steady stream of new affiliate sellers that will promote your products and services for you. dramatically increase your bottom line profit without spending an extra dime on advertising and promotion. reduce your personal workload so you'll have time to enjoy the benefits of operating your own business. "Confessions of a Follow Up Marketing Geek"
Did that list of benefits get your attention? Can you see just how much of your profit potential you're leaving on the table for your competitors to claim - and how drop-dead-simple it is to turn that table in your favor? Can you see just how an effective and professional follow up marketing system is not optional? And that it's a required tool for any online business that intends to be a long term success. .... then there isn't much more I can say to convince you of your need for this powerful guide, or of the benefits you'll be passing up if you don't order today. But I'm convinced .... and I'll guarantee the value of this product! Order "Confessions of a Follow Up Marketing Geek" today and use it for the next 60 days. Try out the step-by-step follow up "recipe" on every promotion you run, and pay attention to the results you get. Then, if you don't see a dramatic increase in your sales and response - or if for any reason during that 60 days you decide it wasn't worth your time or money, just email me a copy of your original sales receipt and I will issue a full refund within 24 hours - no questions and no hassle. Plain and simple - if you're not happy I will not keep your money! Now I'm not going to insult your intelligence by tacking on 27 meaningless "bonuses." The precise 14-step follow up marketing "recipe" alone can pay back your small one time investment hundreds of times over for years to come. And that's not to mention the in-depth online training videos and other proven tricks and techniques I'm about to lay on you. But I do want you to have this additional resource .... just to be sure you get the full picture of how to profit from follow up email marketing to your own opt-in list. This .pdf guide leads you through the entire publishing process - from concept to delivery - for any sort of newsletter, ezine, or special report you want to create and deliver by email. You'll also discover the exact steps to take to build your mailing list quickly and on full automation, with a minimum of hassle for you. .... to this dynamic new guide, plus a copy of this Dan B. Cauthron original webpage to sell it with. You can keep all the money from each sale you make. And remember - this follow up email marketing system will work for you or you get your money back - every penny of it! So the only risk you will absorb is if you continue doing business without an effective email follow up marketing system! And that is a tough risk to take - especially when you can make it go away right now. So wrap your fingers around a copy of "Confessions of a Follow Up Marketing Geek" - and I promise that within one hour from now, you'll be so glad you did! P.S. - You probably already know that it's a constant struggle to get traffic to your website. But if you believe that traffic by itself is a solution to success - then I have a quick three word bulletin for you. Each visitor to your website presents a potential for putting hundreds or even thousands of dollars in your pocket immediately and over years to come. But if you're allowing 80% or more of them to slip away - never to be seen or heard from again - if you're not following up by email and grooming each of those visitors to become lifetime customers - then in terms of business success, you might as well pull your pistol and shoot off your own foot! Once again - it doesn't matter if you're an affiliate marketer, or you're selling your own products (or both.) You can relieve the pain right now.